Gajar Halwa – Cook It Daily! Wash the carrots well, and peel off the surface. Grate the carrots (Note: Wash the carrots before grating, DONOT wash the grated carrots- otherwise the juice of carrots will be washed away too). Take deep frying pan over medium flame, and add the ghee in the warm pan. Add grated carrots and roast/sauté till the water almost vaporized. Add Milk and sugar, cover the lid and cook for another 5-8 mins over medium flame. Add Khoya and mix it well, keep stirring for another 1-2 mins till it becomes dry, yet soft, and smells sweet. Close the flame and mix the roasted nuts, and close the lid closed for a min. For garnishing; sprinkle some fine grated pistachio and almond, decorate with few cashew nuts and resins. You can use a bit of silver vark too if you like. 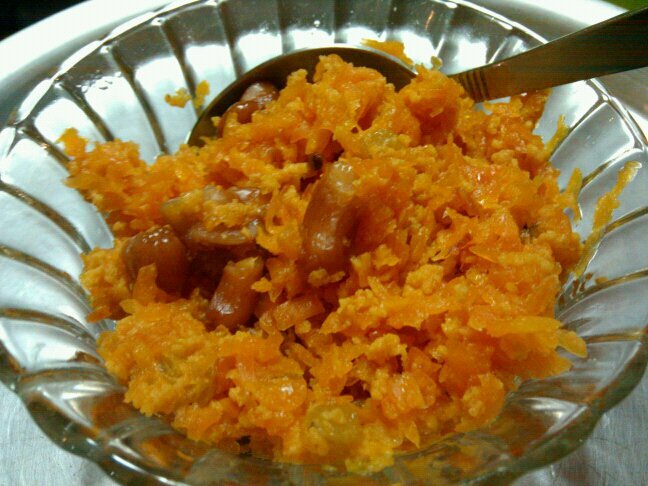 Friendz Try This Recipe ….Gajjar Ka Halwa.